Home Enjoy Life Ready to Go Grateful? 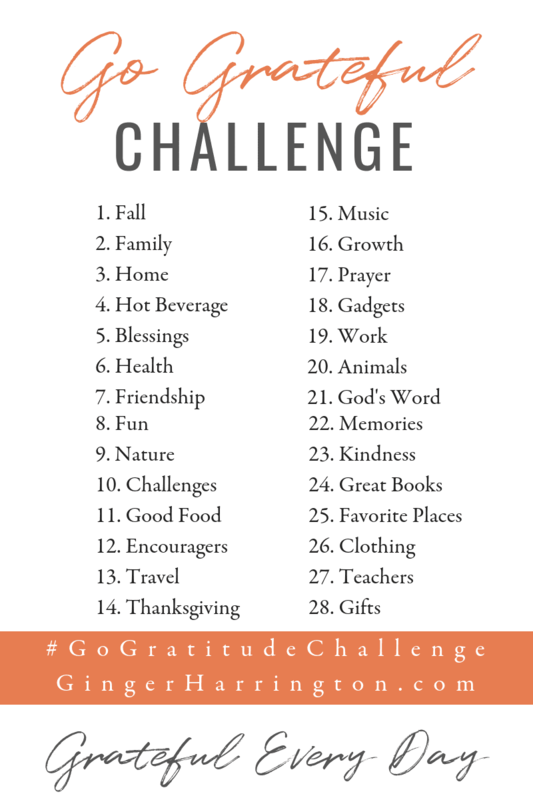 Take the #GoGratefulChallenge! Did you know gratitude can change your perspective, improve your health, and enhance your self-esteem? Can even help you sleep better? It’s true, believe it or not. 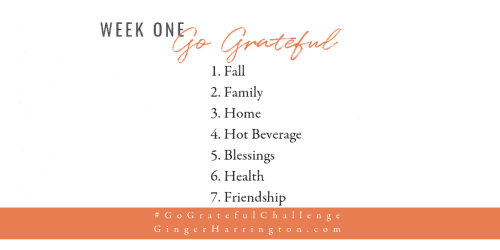 This month I’m throwing down a gratitude challenge! We all believe that gratitude is a worthy goal. On the spiritual side, gratefulness is also a holy habit that draws us closer to God, strengthens faith, and brings freedom from worry. In the busyness of overloaded schedules and the complexity of today’s world, a thankful attitude can feel out of reach. It’s not easy to maintain an attitude of gratitude. At least not for me. I need inspiration, reminders, and motivation to keep choosing gratitude when it’s easier to worry, complain, or gripe. Building holy habits and making moments for gratitude doesn’t just happen. It takes intention and practice. And since I don’t like to play by myself, I’m inviting you to join the challenge. Together let’s have fun cultivating gratitude this month. It takes at least 21 days to build a habit, so let’s make this month count. With daily prompts, short action steps, inspiring quotes, biblical truth, helpful tips, and fun prizes we are choosing grateful every day this month! Check the end of this post for details or you can sign up below. Our playing ground will include my website, Facebook, Instagram, and Twitter. Participate on the social platforms you enjoy. You can respond to FB prompts, share a photo of the day on Instagram, answer a twitter question, or comment on blog posts throughout the month. When is the last time you started your day in a good mood and all it took was one thing going wrong to plummet your good vibes to negative thinking? It happened to me just yesterday. I’ve been juggling tasks and traveling to speak at multiple events this fall. Some days I feel like I’m barely keeping my head above water. You know that feeling, right? I love to be on the go, but sometimes I feel frazzled. Each time stress builds, I take a deep breath and say this prayer: “Lord, I rely on you in this moment. I’m trusting you to help me.” I talk about this kind of thing in my book, Holy in the Moment. That’s a practical prayer that empowers us to choose holiness, bringing God’s best in the moment. But even so, I still caught myself muttering as I loaded the washing machine. Griping and complaining, I spiraled into a state of momentary overwhelm. I realized I was even feeling a twinge of resentment about some fun things coming up! Time to slam on the breaks of a bad attitude that can be our default when life is stressful. This girl’s got to do a little more practice when it comes to choosing gratitude rather than griping, thankfulness over worry, and appreciation instead of resentment. Shoving the wet clothes into the dryer, I closed the door with a firm push. And I did the same thing with my thoughts. Making a firm decision to be grateful changed my perspective. Recognizing when thoughts and attitudes need to change is one thing. Doing it is another. This is why a challenge is a great opportunity to build a better habit! As soon I closed the door to my frazzle, something wonderful happened. When I was busy with my mental chatter of worry and stress, I couldn’t hear what God wanted to say. My focus riveted on my to-do list and my emotions lectured me, accusing me that I wasn’t doing any of it well. Enough! Time to Go Grateful! Choosing gratitude changed my attitude. What seemed inconvenient is really a blessing. That interruption is actually God’s provision for rest in a busy season. Lickety-split–my perspective changed. Friend, that one thing changed my entire day and probably a lot more. This is a simple example of why gratitude matters. Why it’s worth fighting for. Gratitude is the gift of holy for your heart. Ready to get your gratitude on? 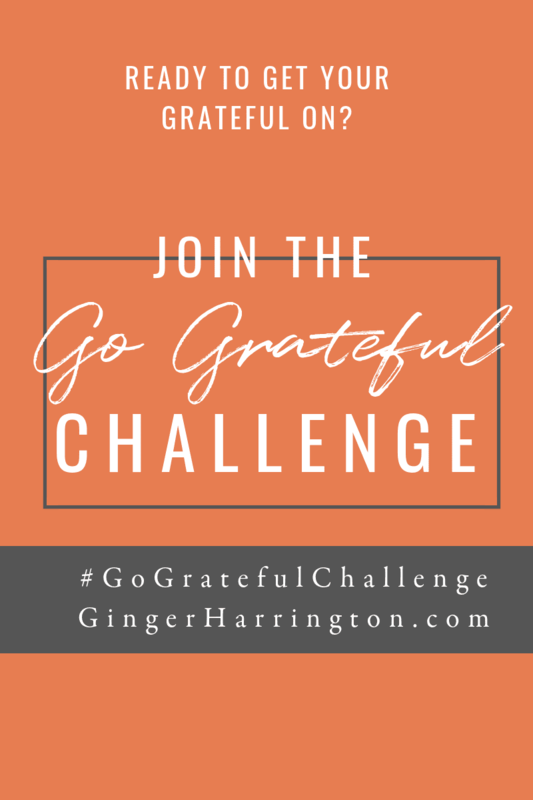 Join the #GoGratefulChallenge! Grateful moments won’t happen by accident so let’s practice together. I will have some of the challenge on my website, but email subscribers will get tip sheets, quote graphics, and extra chances for prizes. Facebook, Instagram, and Twitter will be our playing ground for posting your challenges. You can play on all three or just participate on the platform you prefer. My Facebook page is where most of it will take place, including FB Live broadcasts for extra fun and motivation. Tag me at @GingHarrington. Instagram is where we’ll have a photo challenge is that’s your thing. Use the hashtag #GoGratfulChallenge and tag me @GingerHarrington. There will be a prize drawn from Instagram participation at the end of the month. Can’t commit to the entire month? No problem, it’s a busy time. Love to have you join us for one week or Go Grateful all month. Here’s how to enter the contest. The more ways you participate, the more entries you earn for a prize. You can enter up to the last week of the challenge on November 23. Challenge ends the last day of November. Follow me on Social Media (Facebook, Instagram, Twitter, or Pinterest). Like, share, or comment on Facebook posts. Be sure to tag me @GingHarrington on FB. Invite friends to do the challenge with you. (Tag me). Use the hashtag #GoGratefulChallenge on your posts. Get ready! Get set! Go Grateful! #GoGratitudeChallenge, Gratitude, Holy in the Moment, Thanksgiving. Bookmark.